10 Activities to Do With a Boulder Senior Loved One Who Has Alzheimer’s | BrightStar Care " "
Your Boulder Senior Loved One has Alzheimer's: What Can You Do Together? Alzheimer’s disease and other types of dementia are progressive illnesses. It’s understandable then that when a Boulder/Broomfield senior loved one receives an Alzheimer’s diagnosis, many families respond with an urgent wish to spend more time together. However, finding healthy activities that take into consideration a loved one’s changes in memory, thinking, mood, and behavior requires some thought. As part of our ongoing series for Alzheimer’s Awareness Month (organized by the Alzheimer’s Association), we’ve highlighted 10 simple activities the entire family can do together. Keep in mind that as Alzheimer’s symptoms progress, you’ll want to tailor activities to accommodate. For instance, for someone with late-stage Alzheimer’s, sensory activities such as describing a smell or petting a dog will be more appropriate than a complex game. Old family photos stir a treasure trove of memories. Sit side-by-side on the sofa or porch and invite loved ones to recount stories. These moments will in turn become the basis of precious memories for you, your Boulder/Broomfield senior and other family members in the years to come. The health benefits of walking are many, and it’s something the whole family can enjoy. As you walk, point out the sights and sounds of the season, whether the arrival of birds in the spring, or the changing colors of fall. 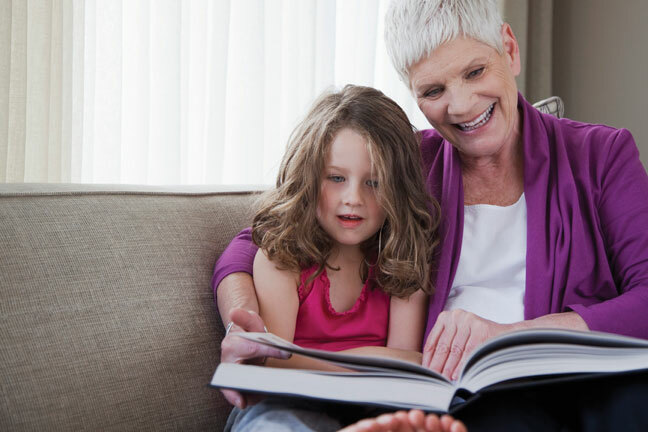 Children and grandchildren can practice new reading skills by reading aloud to a relative with Alzheimer’s. They might also try creating their own stories together. Start with a simple prompt, such as planning an imaginary day at the beach. Music can calm as well as conjure old memories. It can also provide a basis for building new memories: choose songs with catchy melodies and simple lyrics and hold a singalong. Crafting has a meditative effect. Ideas include stringing beads for a necklace, or Cheerios for the birds. Even just rolling yarn can absorb the attention of a Boulder/Broomfield senior with Alzheimer’s. Large-piece puzzles provide an activity that’s both tactile and visual. Sorting through pieces for the right fit is engrossing and watching an image emerge can create a sense of accomplishment. Bingo requires only the ability to identify letters, numbers, and other basic symbols. By completing a row and calling “Bingo,” an individual can fell a sense of accomplishment. Invite a loved one to help with light tasks, such as washing produce or folding napkins. Praise their efforts and let go of imperfect results—involving them in daily chores can build confidence and a sense of normalcy. As symptoms progress, Alzheimer’s patients can engage their minds with sorting tasks. Give them a deck of cards to pile by suit. Or ask them to help sort socks from the dryer—again, asking them to assist with meaningful household tasks can inspire self-esteem. For family members with late-stage Alzheimer’s, activities will likely need to be pared back. Sit with them while they pet a dog or soft blanket, ask them to describe the scent of baking bread, or watch for birds together by the window.